Here are a few things I've tried that have worked out for me, as I figured out that a garden railroad with toy trains was not only possible, but fun. 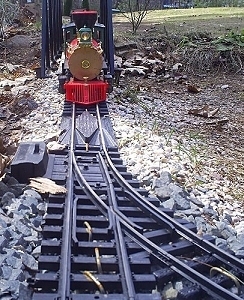 The photo to the left below shows a Scientific Toys brand train on a metal bridge. 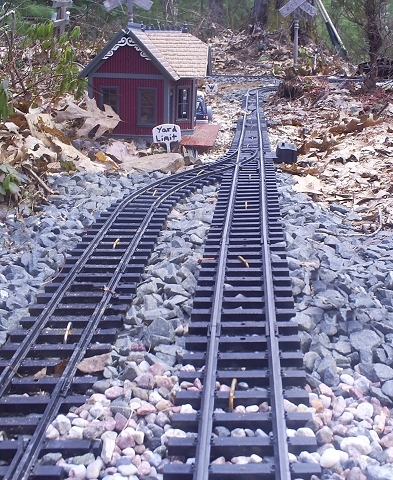 You can see that I used a board to fasten the track down. The New Bright track on the bridge has one little hole on the first or second tie on both sides of an individual piece of track. 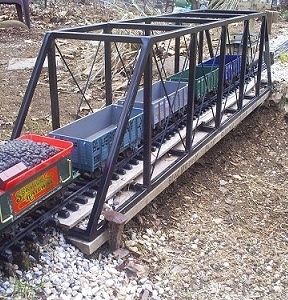 So that a small wood screw would fit through each hole of the track on the bridge, keeping the track in place. 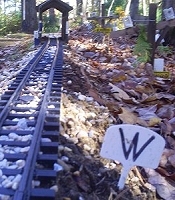 The picture to the right below shows what can be done to prevent the plastic track from warping during certain types of weather that may cause the tracks to warp or bend up in the air a little bit...... The metal pieces over some of those ties are called garden staples..... I found them at my local Walmart, and they appear to do the job quite well! 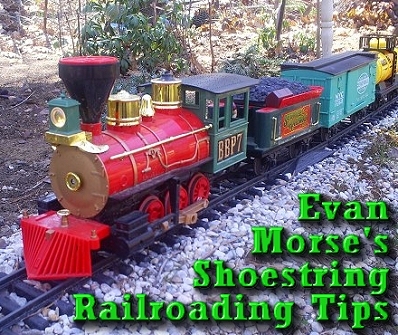 One great aspect about "shoe-string" railroading is looking for ways to do things with little or no investment. As an example, the photos below show what someone can do with those plant tag type of things that stick in the ground to identify which plant is which...... 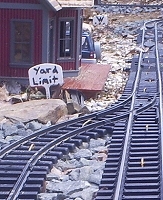 In thse pictures for example, they make good whistle posts and yard limit signs. 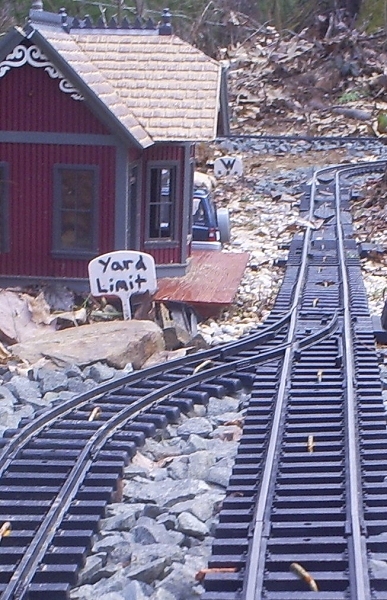 But they can also be used as mile posts or mile markers as well. As I am writing this, it is still early in spring, my garden isn't in full bloom yet. But when it is in full bloom, I shall definitely take some more pictures. In the meantime, if you have any questions or comments for me, please contact Paul, and he'll forward your comments to me.